You probably know that taking a kayak on a fishing trip can be a pain in the neck if your vessel is too heavy. If you want to have an enjoyable finishing trip, you need something lightweight and compact. The Sun Dolphin Journey 10 SS is specifically designed to make your trip more enjoyable. In order to help you with your purchasing decision, we’ve created this Journey 10 SS Kayak review. We will go over some of its main features, pros, and cons. Here is a quick recap on what we think of this kayak. Portable, Easy to move around. 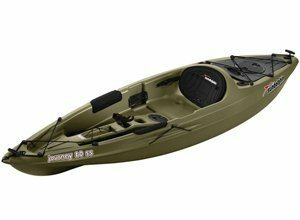 This particular kayak is a SOT (Sit-On-Top) model, specifically designed for people who want to spend more time finishing hard-to-reach spots. The Journey 10 is only 10 feet long, and it weighs around 250 pounds, which means you won’t have any trouble carrying it from your car to the beach. It allows you to bring enough gear for a day-long trip. It works great for fishers who are looking for a good, short fishing experience on rivers, lakes, and even the ocean. 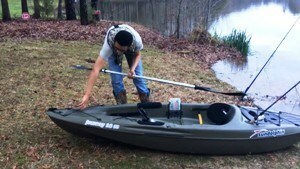 However, this kayak isn’t perfect for multi-day fishing trips. If you want to go camping and carry a few-days-worth of gear in it, you should look for different models of fishing kayaks. With that being said, let’s take a closer look at some of its main features. Although the Journey 10 is pretty compact, it still offers a ton of storage options. For instance, you can find a big storage hatch behind the seat. This hatch will keep your gear dry and safe during the trip. There’s also a handy compartment at the bow of the vessel. Both of these storage areas have bungee cord rigging. There are also two mounted rod holders on the sides and a swiveling one on the front of the kayak. Furthermore, you have two places to store your paddles on both sides of the kayak. So, when you’re too busy dealing with your rod, you can simply place your paddle there. And that’s not all. You also have a cup holder that’s there to help you store your bottle if you suddenly catch a fish. Right underneath it, you have a small compartment with bungee cords where you can keep your water. Last but not least, you have a small hatch that can keep your keys, phone, and other small personal objects. Seeing how the kayak weighs only 44 pounds and how it’s just 10 feet long, we can safely say that it’s pretty portable. If you enjoy heading out and fishing for a few hours completely alone, this is the right kayak for you. When you’re out in the wild, you can carry it from your vehicle to the beach all by yourself. The retractable handles will allow you to seamlessly transport it with one hand. Journey 10’s relatively short length allows it to fit in most trucks on the market with the tailgate down. You can also choose to transport it using roof racks. This post will show you the latest solid quality roof rack in the market. Although your own abilities as a fisher decide whether you take a plunge on your fishing trip, one factor is more important than others. If you’re not too experienced with kayaking, stability is a crucial factor. The best kayaks for newbies are rugged and stable enough to handle the learning curve. Kayak’s stability basically comes down to only two factors: length and size. Shorter kayaks and the ones with a wider body are much more stable than lengthier ones. With ten feet in length and 30 inches in width, the Journey 10 is more stable than your average kayak. 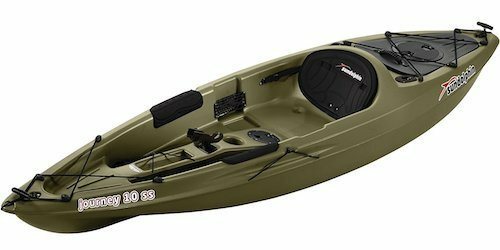 What’s more, this kayak is designed for slow-moving rivers and lakes. Therefore, it’s able to handle reasonable current without tipping over. While the design takes away the advantage of speed, what’s actually the point of going down the river quickly if you’re only going to fall into the water? If you want to look at other river models, check out our article on the best kayak for rivers. 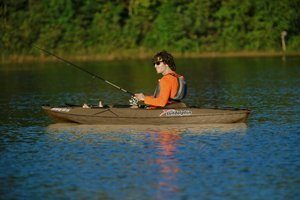 Since this is an honest Sun Dolphin Journey 10 SS kayak review, we need to point out that this vessel is designed for fishing rather than comfort. It doesn’t have a padded seat, and if you plan on spending a lot of time sitting, you should be prepared for some discomfort. However, the seat back is padded. The Sun Dolphin Journey 10 SS seat is molded to the floor, so you can’t replace it. Moreover, since it’s not raised off the floor, you’re going to get your feet wet. Of course, if you want to avoid wet feet, you should acquire some Sun Dolphin Journey 10 SS scupper plugs. But the seat size is large, so you have enough room to shift around until you get nice and comfy. There are other things that can increase your comfort levels. The adjustable foot braces allow you to move around until you find a comfortable position for your feet. Also, the sides are padded, so your thighs will feel comfortable while you’re stabilizing the vessel. YouTube is chock-full of videos where someone takes their kayak onto the water and starts shouting that’s it’s “so shaky” within the first ten seconds. You should definitely ignore those videos. Some people think and act that way because they don’t have much experience on kayaks. In reality, you need at least a few hours to determine whether a kayak is good or not. As we established before, the kayak is pretty stable, and you won’t have any problems when you go into the water. The pole holders are positioned perfectly. The two rear ones are great for trolling, and the front one allows you to position your rod at any angle without moving the kayak. The bungee cords allow you to strap your gear in and not worry about it falling into the water. Moreover, the rear water-tight storage unit actually comes off the boat. So, if you need any additional space inside the actual kayak for a picnic basket or a cooler, you can take it out. Since the kayak is designed for all weather conditions, you can use it all year round. What's more, it will last you for more than a decade. Due to its versatility, you rarely see any Sun Dolphin Journey 10 S mods out there. 1. What kind of water can you use it in? Due to its particular size and structure, Journey 10 can cruise through rivers and lakes, seamlessly. It will take you to some of the more challenging spots on your favorite river. Even though it works best for average-sized people, even a larger person can balance this kayak with ease. 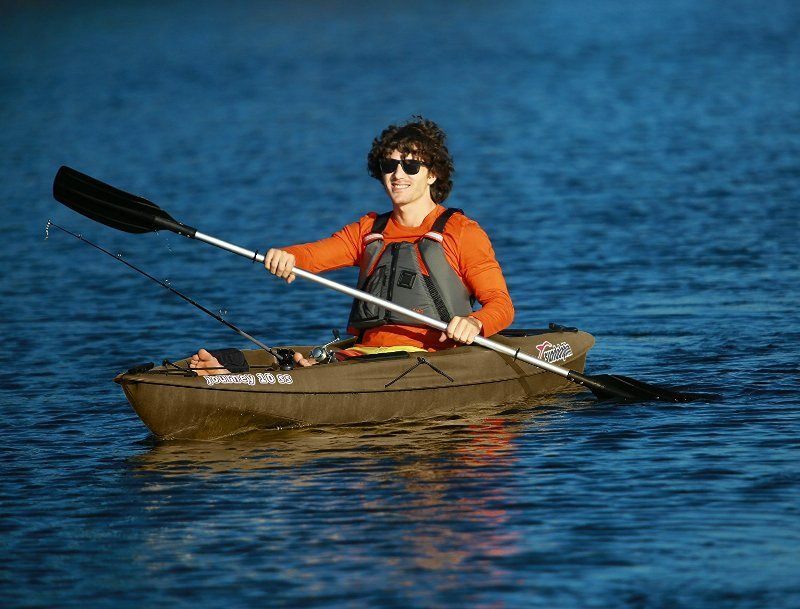 The shape of the kayak allows you to paddle it smoothly, regardless of your speed and weather conditions. 2. Does it come with any additional accessories? The Journey 10 actually comes with a detachable storage compartment. You can use it to carry your fishing gear or catch. It also functions as an ordinary waterproof storage compartment that allows you to keep extra gear dry. Unfortunately, that’s about it. There are no additional accessories besides the storage compartment and the paddle. The latter is more of a necessity than an accessory. That’s probably the biggest downside to this kayak, and it may turn some of you off. The body of Journey 10 is made of high-quality Fortiflex polyethylene. The material ensures that it will last longer than your regular kayak. High-density polyethylene plastic is one of the most versatile materials out there. That’s because the plastic is l and extremely strong at the same time. It’s also impact-resistant, so even if you hit something or accidentally drop your kayak, you won’t have to worry about damaging it. In fact, when you drop the kayak, it will only bounce. In the end, if you want to go on a day-long fishing trip, this kayak can come in handy. 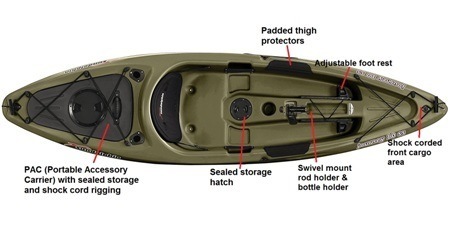 Unlike your average, recreational kayak, the Journey 10 is rigged for fishing and fully equipped with rod holders. If you’re looking for a kayak that you’ll be able to easily transport in your vehicle and take out on water on your next fishing trip, you’ve found the right one. We hope that you found our Journey 10 SS Kayak review enjoyable and that it will help you with your choice. If you want to look for better kayak choices, check out our related articles below.